Mirai Nagasu made history on Monday, February 12, when she became the first U.S. woman — and third overall — to land a triple axel during an Olympic competition. The 24-year-old was competing in the free skating portion in the team event on day three of the 2018 Winter Olympics in PyeongChang when she landed solidly on one foot after making three-and-a-half rotations in the air. It’s one of the most difficult moves in figure skating, and Tonya Harding was the first American woman to land it in 1991 at the U.S. Figure Skating Championships. At the end of her flawless program set to music from Miss Saigon, the athlete from Montebello, California, triumphantly threw her hands up in the air. 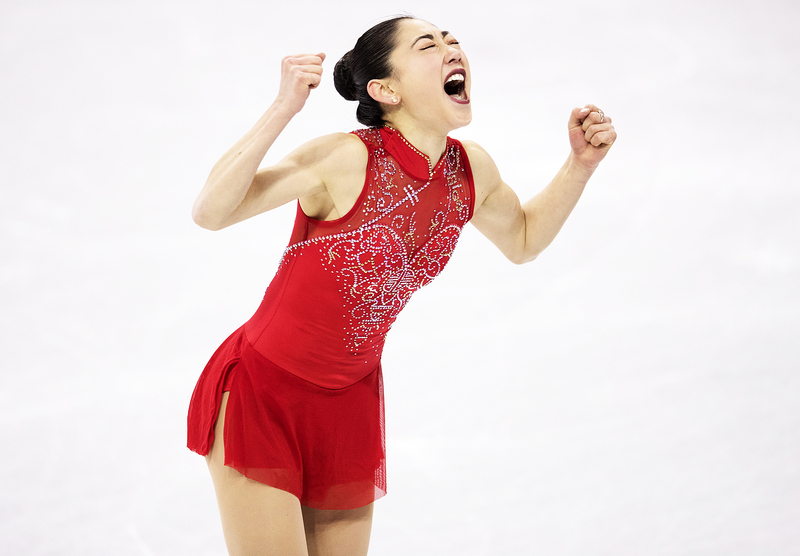 “It’s historical and something no one can take away from me,” Nagasu told reporters. “I wanted to make American proud.” And that she did, finishing with a 137.53 overall score that helped lift the U.S. team to Olympic bronze. Nagasu was dropped from the U.S. Olympic team in 2014 in favor of fourth-place finisher Ashley Wagner, even though she had placed third at the national championships. Nagasu’s close friend and American figure skater Adam Rippon, who made his Olympic debut on Monday, shared a story about their perseverance after his impressive performance.